March 14, 2015 by Josh Haynam	in Interact Case Studies. I must preface this article by saying that the quiz being discussed called “What kind of difficult woman are you?” is completely ironic, and actually launched on International Women’s day. I think the following conversation shows pretty decently that it is not meant to be derogatory in any way. It started when I logged into Google Analytics on March 5th, 2015. There was a particular quiz URL that was getting some strong activity. Nothing too special, I’d seen it a hundred times before, but nonetheless still interesting. I took note of the URL and moved on with my day. The next morning something amazing happened, traffic to that quiz URL began to slowly rise until it broke through the glass ceiling and exploded, getting thousands of simultaneous hits. I was taken aback, I’d seen this kind of thing before, but never in such a close manner and never with such voraciousness. By the end of the day on March 7th, two days in, the quiz had reached over 120,000 people and been shared 18,000 times. It was the definition of virality. Each person who shared the quiz brought their friends back to the quiz and for every person who viewed the quiz, they brought back more than one person with them. Now here are the stats on the quiz. All of this happened in about four days, with the majority of the traffic and shares happening in the first two days. I then did some digging into the social stats to see what kind of breakdown there was amongst social networks, and I also used Open Site Explorer to check how many backlinks the quiz had brought in. The vast majority of shares (like 98%) came from Facebook. 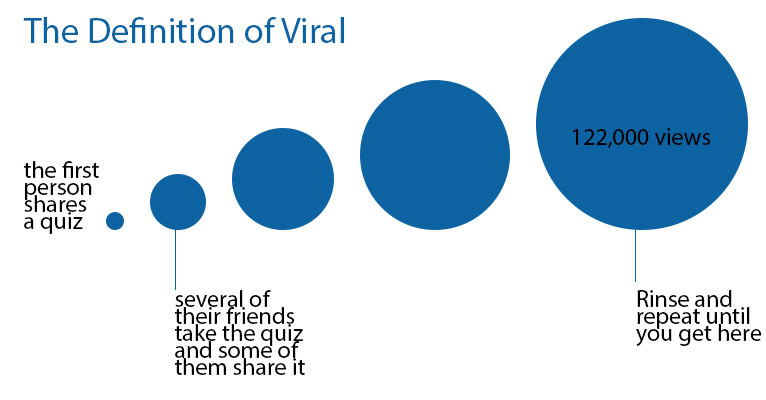 This is typical of what we’d expect on a quiz that goes viral. The quiz has 14 brand new links. The page authority hasn’t yet risen because it’s too soon to make that calculation, but this is still remarkable. (Side note: it’s nice to get an initial spike in traffic from viral content, but if you want to build a sustainable publishing brand, quizzes need to have a staying power that can be provided by SEO traffic. Some quizzes actually get more traffic AFTER their viral spike than during like this one from Forbes). The quiz was embedded inside a page on DailyLife.com.au which is smart for a couple of reasons. First, when people share the quiz, traffic will go back to this page and DailyLife will get some healthy ad revenue. Second, it provides a built-in attribution system – instead of taking this quiz and wondering where it came from, you know the source and build familiarity with the brand. 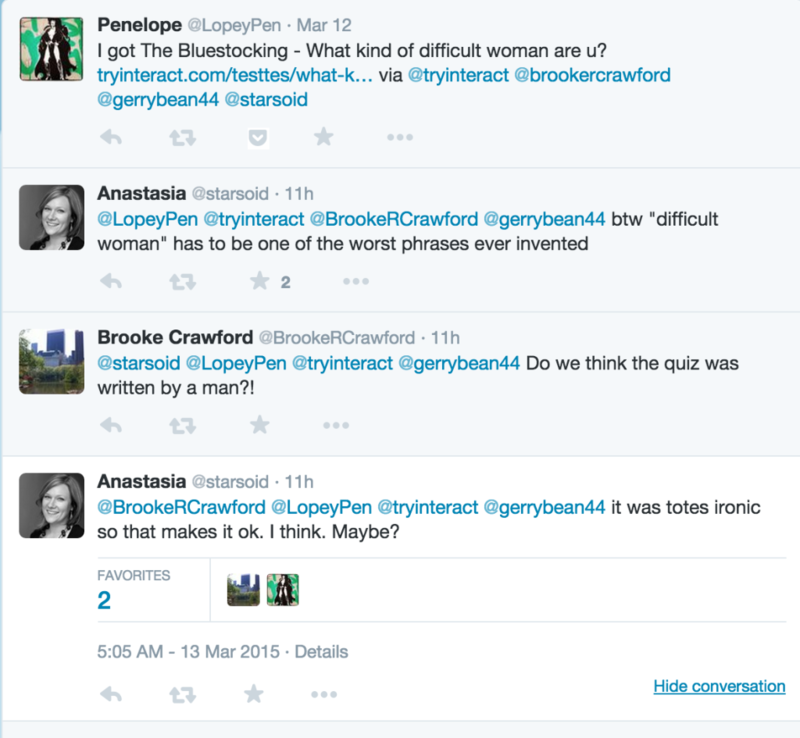 The quiz was posted with the #IWD2015 (for international Women’s day 2015). It’s hard to say what role this # played in the success of the quiz (I would guess not very much, because Twitter accounted for a small portion of the total shares on this quiz). This datapoint was extraordinarily interesting to me. 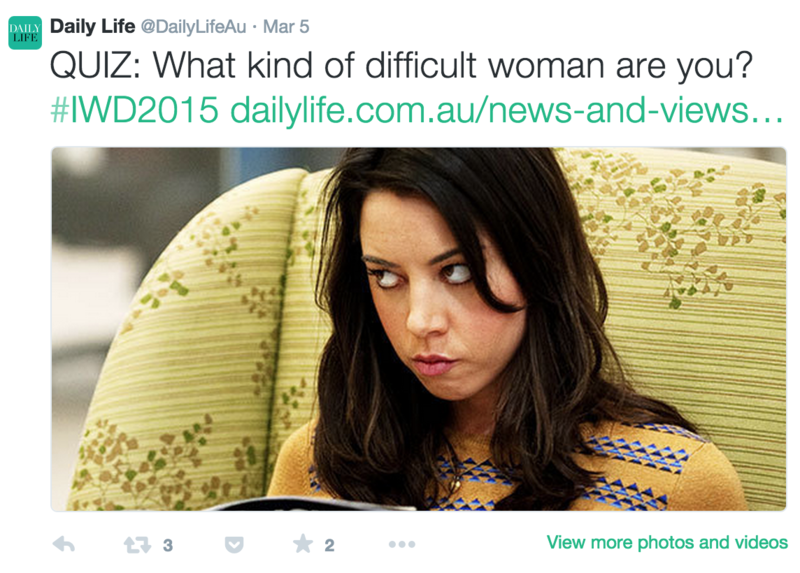 The official DailyLife twitter share accounts for a very small percentage of the overall traffic to this quiz. (note that they didn’t even share it on their business Facebook page). March 6th 12:00 pm: Twitter and Facebook start to explode with sharing. This is where things get really interesting. I had read in the past that virality occurs when a lot of normal people share the same thing in a short period of time. This was definitely the case with this quiz. Below is a screenshot of the biggest influencers who shared the quiz, the top sharer only has 17,000 followers, not exactly mind-blowing numbers. At the end of the first full day, over 80,000 people had taken the quiz. I noticed an interesting pattern during the day as the quiz swelled with views. The spike started with a lot of people sharing their quiz, nearly as many people as viewed it at first. Then, after a couple of hours the view count would shoot up as people who were reading through newsfeeds and saw others’ quiz results began to click through and take the quiz. Things started to slow down and it looked like the end for this quiz. It looked like the spike had come and gone. Activity slowed down and people went away. The rise started slowly, with just a few shares, and then it broke open again. The resurgence started much the same way as the initial spike, where at the beginning there were nearly as many people sharing the quiz as there were people taking the quiz – until the views began to catch up and speed past the shares. By the end of day two the quiz had reached over 122,000 people. This was extraordinary. In just over two days a quiz had skyrocketed from nothing to reaching enough people to fill up the entire city of Green Bay, Wisconsin (where the Packers play, I’m a football fan). You don’t need a big brand, you don’t need famous influencers, you don’t need ad dollars. When Daily Life posted and shared the quiz, it got what I would imagine is a normal amount of traffic for an article they write (about 8,000 views – it’s a pretty good website). However, what happened after that is what I find fascinating. Droves of normal people started sharing the quiz to their 50 or 100 followers. It didn’t take a famous person or a huge initial audience to get this quiz going, it took the power of the crowd to give it the boost it needed to go viral. Now what does this mean for your brand making quizzes? I think it means you need to know what your average reader cares about. Even if you do get some famous person or big brand to share your quiz, it will make a short-term and nearly unidentifiable difference in the overall traffic of the quiz. What you really need is a bunch of very normal people to share the quiz with their friend group to get the traction needed to launch a viral quiz.